MIDDLEBURY – No one from Concord had ever jumped into Northridge’s new swimming pool in celebration. 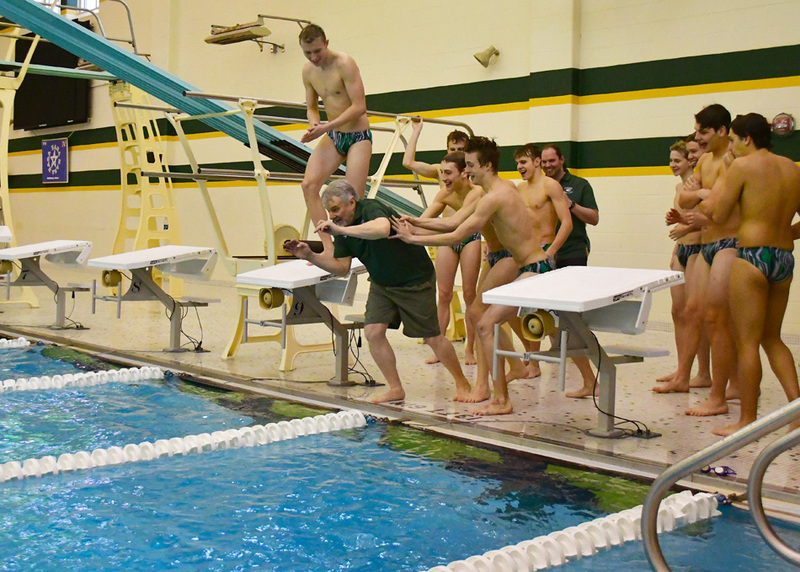 That changed Saturday after the Minutemen upset 20-time defending champion Northridge, sending coach Tom Johnson and the mates bellyflopping into a well-deserved Northern Lakes Conference Boys Swimming title. Johnson saw his team fend off Northridge, 392-368.5, to claim its first title since 1994 and fourth overall, and end Ridge’s impressive two decade long run that stretched back to 1999. Concord also ran 7-0 in the regular season, which saw the Minutemen crack Ridge’s 20-year dual undefeated streak in December as well. With that, a drenched Johnson remained complimentary of the rivalry, which saw the two teams fiercely battling each other in the consoles nearly as hard as it was for event titles. Wawasee’s Alex Troutman works the backstroke leg of the IM consoles. “Last year’s sectional made it clear that you can win the meet in a variety of ways,” Johnson said, occasionally wiping water dripping from his hair. “The console heats score points, too. We won the meet in a console heat at sectionals last year. It was a privilege to race them today. They were amazing, they swam really well. They competed every race, every event, every place. That’s what it’s about. That brings out everybody’s best. It was an honor to race in the same pool with them today. 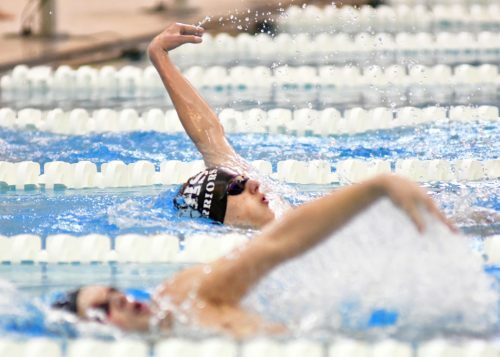 Concord had just four event champions to Ridge’s six, but made up for it in spots like diving, where the Minutemen outscored the Raiders 43-0 with Ridge lacking a diver and Concord landing three in the top seven. Kal Findley won two titles for Concord, taking the individual medley at 1:54.93 and the backstroke at 52.53. The Minutemen opened with a 1:38.48 in the medley relay and came back in the 200 free relay at 1:28.94, both with Findley on board. Northridge had Nick Dibley win titles in the 100 and 200 freestyles at 47.52 and 1:43.96, and brother Luke Dibley won the 500 going away at 4:48.17. Turner Koch won the butterfly at 54.03, Joey Garberick took a hotly contested 50 free at 22.05, and Ridge closed with a 3:19.45 in the 400 free relay. The battle for third saw Warsaw post a 322 to edge Wawasee’s 317 and Goshen’s 306.5. Memorial (134), NorthWood (128) and Plymouth (112) rounded out the group. 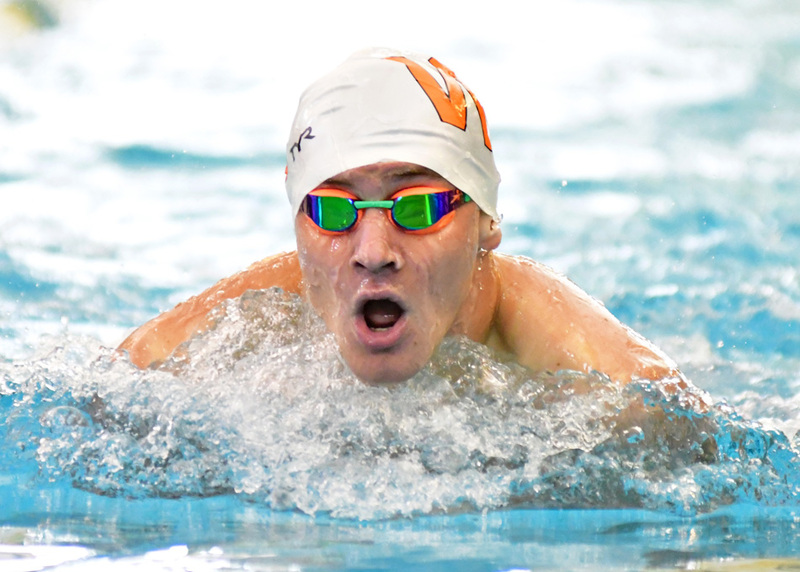 The Tigers laid claim to the only record from the two-day tourney, which came from Grant Knight in Thursday’s prelims. His 56.39 in the breaststroke qualifiers set meet and pool records, and the junior made the hot start stand up Saturday in swimming a determined 57.07 in the finals to win easily. Knight’s day reciprocated his work Thursday, showing very well with third in the IM, then nearly catching Concord’s Matt Bond on the final leg of the 200 free relay as Warsaw posted a 1:29.40 with Knight making up nearly two strokes of distance from the third leg. Alex Cook also had a big meet for Warsaw, outtouched at the wall by Garberick in the 50 finals by just seven-hundredths, but came back to set a personal record in the 100 free at 49.39. Warsaw’s medley relay finished third and both Zach LaLonde and Nick Bazzoni secured a pair of top-fives in their individual works. Michael Ray won the consolation round in the 200 free. NorthWood’s Caden Jenkins celebrates on the podium after winning his first-ever postseason diving title. Wawasee didn’t have a champion, but had Jared Krugman pushing for two. Krugman faded in the 200 free, taking second at 1:47.39, and a similar fate befell him in the 500, keeping up with Dibley until the final three laps before falling off the pace for a runner-up 4:54.24. Daegan Kingrey also had a pair of top-fives in the 50 and 100 freestyles, and the Troutman brothers claimed consolation wins, Alex the IM and Aaron the 500. 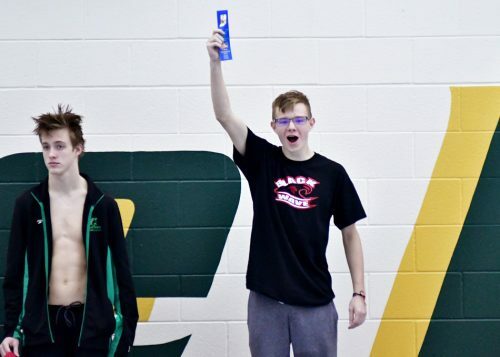 NorthWood won its first NLC event in recent memory when Caden Jenkins posted a 420.15 series of dives to evade Concord’s Aaron Leas and a pair of Warriors. Jenkins led the morning session, then dug deep to hold off Leas by 33 points to take his first-ever tournament title. To say Jenkins was excited is an understatement. Wawasee’s diving duo of Dane Jenkins (351.40) and Brady Claassen (345.45) were third and fourth, setting themselves up well for the sectional in three weeks, which is back at Northridge Feb. 14 and 16. Warsaw’s Grant Knight is the new NLC record holder in the breaststroke after this week’s conference championships.